Van Shopping? Check out this 2013 Chrysler Town & Country for sale Greater Kansas City area! Room for a barrel full of monkeys! FWD 3.6L V6 Leather & Heated Seats, Quad Seating, Rear Entertainment DVD System, Uconnect 730N CD/DVD/MP3/HDD/Navigation, ParkSense Rear Park Assist System, ParkView Rear Back-up Camera, Alloy Wheels, Power Adjustable Driver’s Seat w/Memory Position Settings, Power Adjustable Pedals, Remote Start, Blind Spot Monitoring, Cross Path Detection, Power Sliding Van Doors, Power Liftgate, Stow n’ Go Seats, Bluetooth Connectivity, Certified Warranty! Chrysler has outdone itself with this superb-looking 2013 Chrysler Town & Country. It just doesn’t get any better for you and your family! Pile everybody into this roomy Town & Country for a smooth ride that is sure to impress the entire clan. We will pick you up at the airport or ship your vehicle to you! 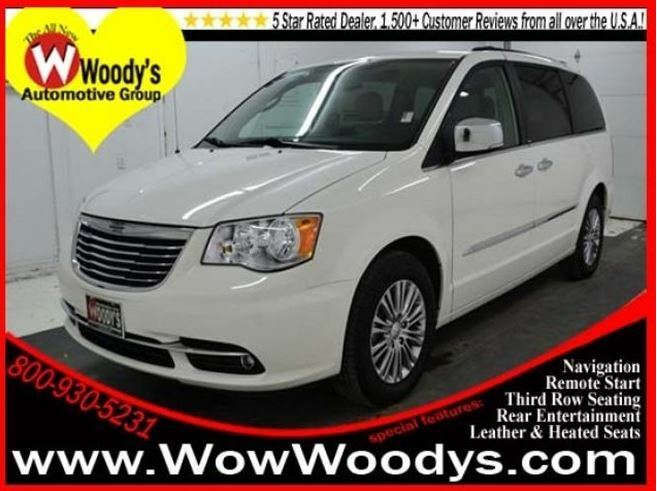 If you’d like more information about this luxurious used Chrysler Town & Country our huge selection of other used Chrysler or 700+ vehicles located near Kansas City please visit our website and provide us with your contact information. One of our empowered Woody’s Automotive Group Sales Advisors will contact you promptly.